Things heat up as we discuss the Fel Flame in this Pet of the Month! The Fel Flame is a wild pet that can be found in Shadowmoon Valley. Don't confuse this zone with the Shadowmoon Valley of Draenor, though. This pet will only spawn in Outland. To find the Fel Flame you'll need to find its preferred habitat. Wherever you find fel fire, it's likely that a little flame is wandering around nearby. The largest concentration of fel fire and lava can be found at The Hand of Guldan in the center of Shadowmoon Valley. However, the Fel Flame can also spawn around any of the smaller pools in the zone. Just be wary of the green waters since they're usually occupied by hostile creatures. If you have flying in Outlands, be sure to fly up and around the volcano at the center of The Hand of Guldan. The Fel Flame may not look like it, but it can be a mountain climber and will sometimes be on the ledges of the volcano. It might be possible to coax the this pet to spawn by killing creatures and miscellaneous wild pets near The Hand of Guldan, but the effectiveness of this method is mostly anecdotal. Of course there's no harm in trying whatever you can to get your hands on this hot pet! The Fel Flame is good for only one thing: pure elemental destruction. It is very heavy on the DoTs. Four out of its six abilities have a DoT component. Immolate and Flame Breath both have a front-end hit with a DoT. Immolate is Elemental damage, while Flame Breath uses Dragonkin damage. 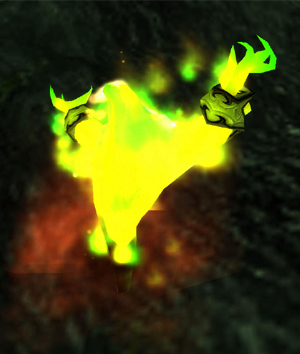 The Fel Flame also uses Immolation, which will deal damage to the front pet for 9 turns. Long DoTs like that are great for combos, but this one will only last as long as your Fel Flame stays alive. Fel Flame also has a weather effect. Scorched Earth deals a certain amount of damage to the front pet on each team for nine turns. However, because the Fel Flame is an elemental pet, it ignores detrimental weather effects, making this another sort-of long-term DoT. The two abilities which don't have a DoT component are Burn and Conflagration. Both are Elemental damage. Burn is a straightforward nuke. Conflagration is the ability that puts the 'cannon' in 'glass cannon'. It is a large hit with a long cooldown, with an additional large hit if the target is burning. Good News Everyone, because the above DoTs and weather effect cause your opponent to be burning. Immolation doesn't, but it shares a slot with Conflagrate so it's kind of a moot point. Like the proverb says, if you can't take the corrupted heat, stay out of the fel kitchen. 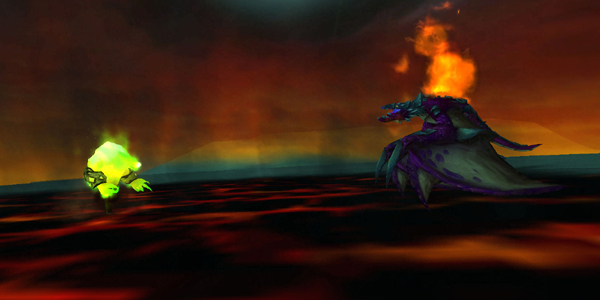 Check out our forum thread discussion on the Fel Flame and submit your own thoughts on this pet. Hey Sweboy. Get a real problem. Is that a violet proto whelp in the picture? imo, one of the most powerful elementals against mechanicals. PS, Outland / Outlands. Meh. There are many lands there, hence plural. If it was more frequently referred to "The Outland", it's likely a greater percentage of people would drop the plural. ^^^ Lmao...is it really. That. Big. Of. A. Deal? "This pet will only spawn in Outlands." It's Outland. It's singular. Outland.